When it comes to leveling up and improving in Guns of Glory, there are some events that are irreversible, such as choosing your talent points or suffering defeat at the hands of a spiteful opponent who decides to obliterate your city. These are all scenarios that you, for obvious reasons, will want to avoid until you’re fully prepared (not the defeat part; if you’re destroyed, that’s it; game over). Luckily, there are many things, both big and small; macro and micro, that you could incorporate into your daily routine in the game, in order to improve your odds of success at the game and to increase your production without overly going out of your way, or having to spend real money. In this article, we aim to share those tips and tricks, so that you can progress at a steady pace, and avoid the destruction of your estate for long enough to actually get somewhere in the game. 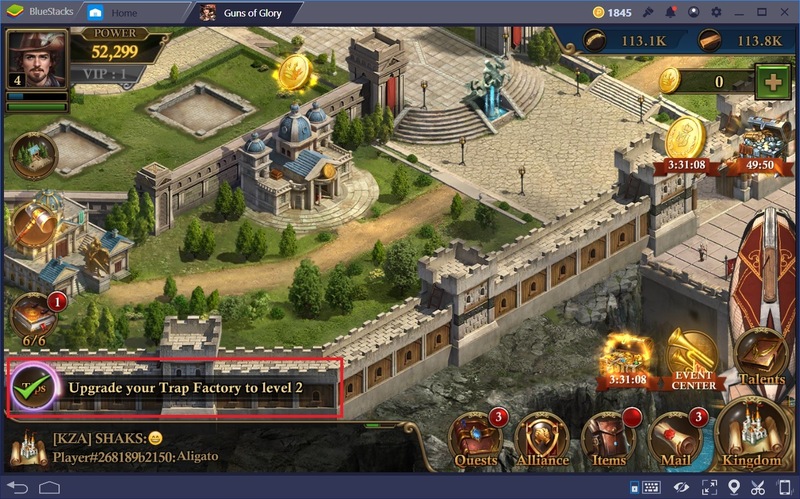 As you progress through the tutorial, you will see that, on the bottom left of the screen, there are several objectives that you are asked to complete. Upon completion, these objectives grant awesome prizes and bonus items, which will definitely come in handy for when you’re trying to make progress in the game. These rewards include resource packs, speedup items, extra builders, VIP items, and much more. The extra builders, in particular, are very useful as they will, for a limited time, allow you to construct or upgrade 2 buildings simultaneously, instead of being limited to one project at a time. 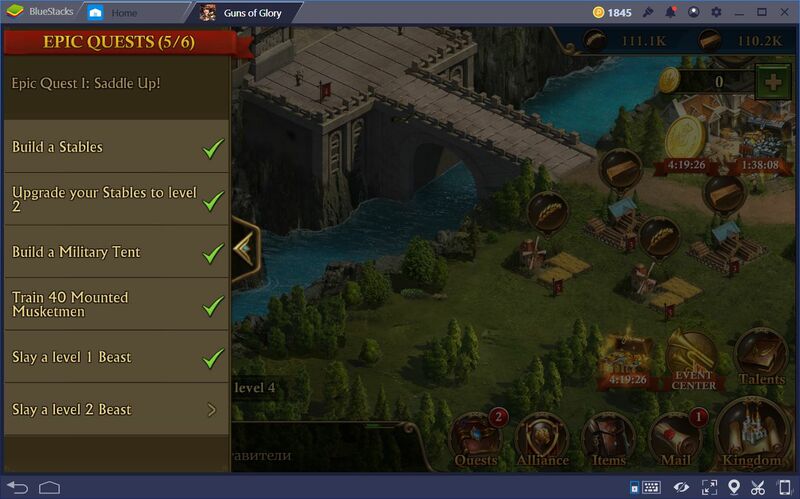 Furthermore, just above the missions, you will also find your epic quest, which consists of a list of tasks that you must complete in order to further your development. 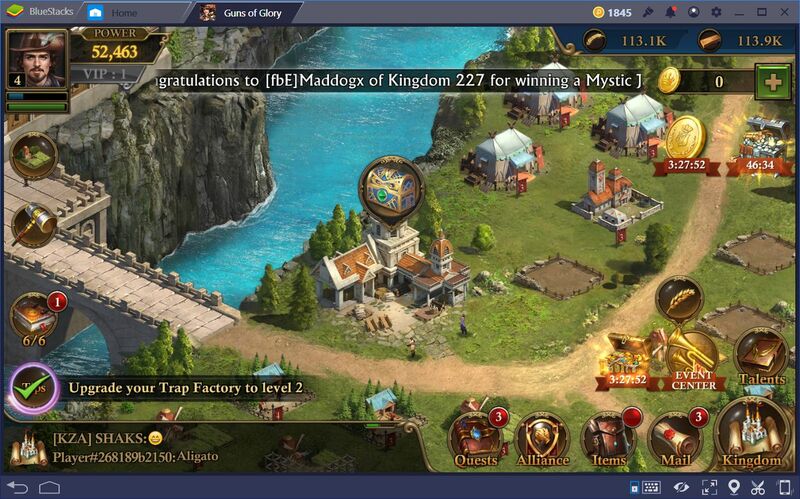 The prizes for advancing in the epic quest are also speedups, resources, and even gold. It’s difficult to make progress in any of these games alone. 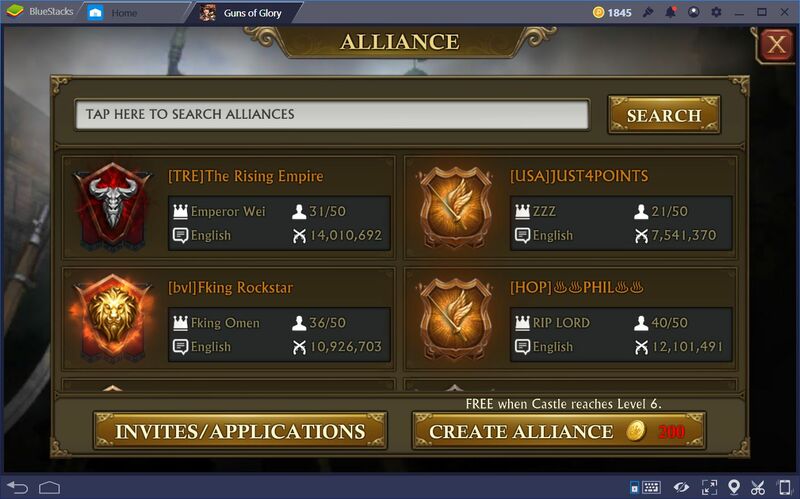 For this reason, as soon as you gain access to the Alliance interface, the first thing you should do is to scout for a decent-looking one and send an application. By joining an alliance, not only will you receive support from your comrades, but you will also gain indirect protection from enemy attacks since, by spying or attacking you, they will risk repercussion from a group of very angry teammates. Once you find a suitable alliance, and you get accepted into its ranks, don’t forget to use your alliance teleport scroll in order to move your estate to an area close to the leader of your new group of comrades, in order to enjoy the full extent of their protection and camaraderie. 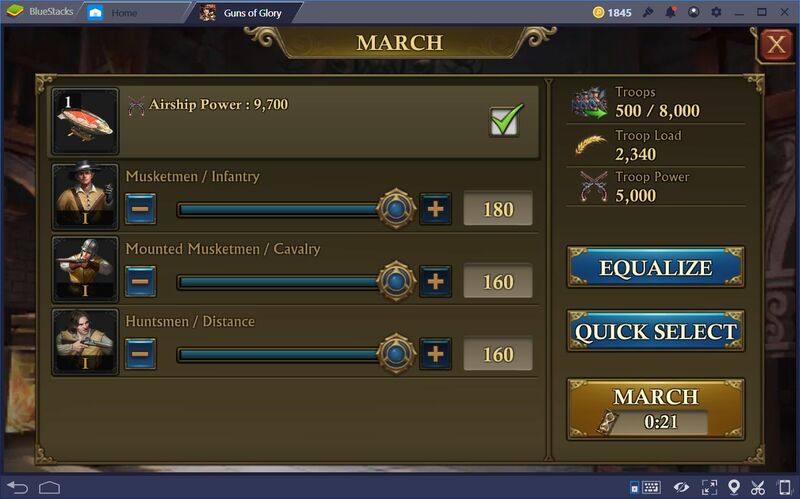 Like in most conquest games, Guns of Glory features a leveling system, which allows your avatar to grow in experience and strength as you complete feats within the game. 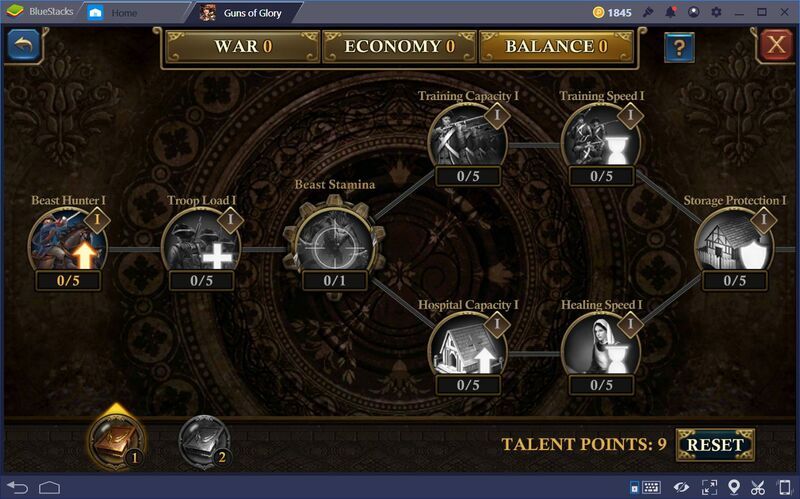 Everytime you level up, you gain several talent points that you can invest in several talent trees, and which can grant you awesome boosts in many areas of the game. However, before going and dumping points into the first skill that gets your attention, please consider that this decision is permanent and that refunding these talent points costs money; money that you might not be willing to invest in the game. War: Features upgrades for your troops such as increased HP, increased offensive and defensive capabilities, and several passive skills that can turn your killed troops into wounded units that can be treated in your hospital. Most of all that you’ll find in this tree will revolve around increase in the attributes of specific units, while the most important skills are locked behind others that you will have to learn before progressing onto them. Economy: Features many, many talents that increase your resource production, as well as the number of resources gathered from gathering points on the world map. Furthermore, there are many skills that also increase your construction speed. The most important skills in this tree are the instant yield, which instantly grants you 5 hours’ worth of production, and instant gather, which fills up the load capacity of all troops that are currently gathering. These skills all have cooldown periods so you can’t really exploit them. We don’t recommend investing in this tree, as the bonuses that they grant can be made up for with consistent gameplay. Balance: As its name implies, this tree offers many skills that benefit many aspects of your gameplay, including beast hunting, production, gathering, attacking, and defending. As a general rule of thumb, you’re better off investing in the war and balance trees. We lean a bit more towards the former, as you’ll be able to assist your teammates from attacks better if your troops are stronger. Similarly, you’ll also have more success at raiding enemies, and attacking Red Guard camps. Resources are, for the most part, produced in your base. 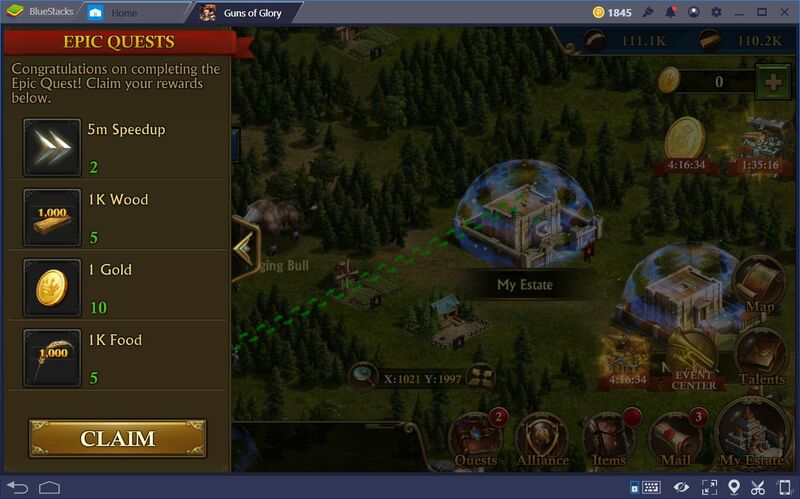 However, you may help speed up the resource gain by taking an active role in the gathering of these vital materials. In this sense, you will always want to send your armies out to gather resources from nearby points. In the beginning, always send out a force of soldiers to the gathering points near your estate. At first, they won’t be able to haul much, but it’s these small contributions that add up over time, which will grant you the upper hand against your foes. However, if you’re confident in your skill, and of your military might, you might want to go ahead and pillage a few of your neighbors. Take a look at the world map and search for newbie estates that don’t have their shields up. In most cases, these are casual players that don’t pay much attention to the game which, to you, means that their resources are ripe for the taking. However, make sure that they don’t belong to an alliance, as you could get into serious trouble for attacking or spying on the wrong type of person. 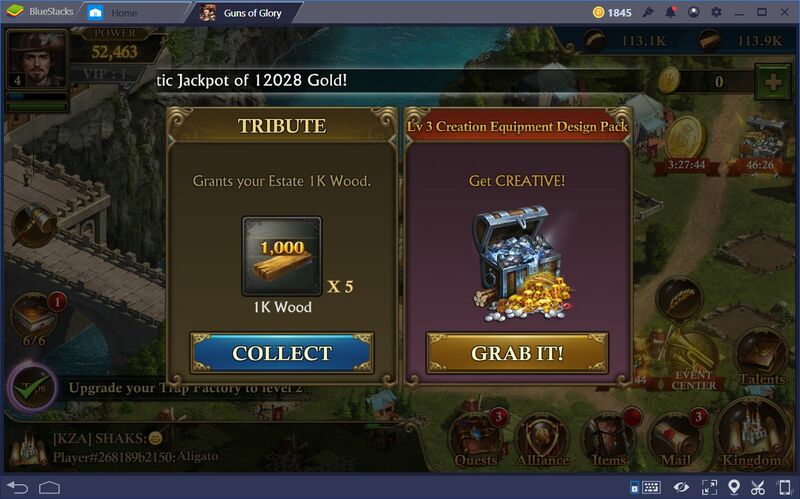 Guns of Glory rewards you for many things, including logging in every day. As you play the game consistently, you will be able to claim daily login rewards, which could come in handy, especially in the beginning. Furthermore, make sure to visit the tribute house often, as they will also give you free stuff periodically. In our case, they give us free stuff every 2 to 5 minutes, and we’re not sure if it actually caps out on a daily basis. In any case, don’t forget to grab your free stuff! 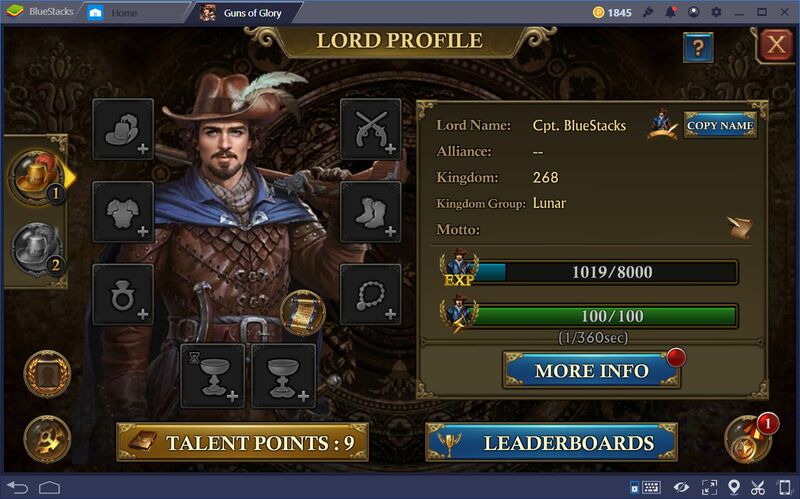 These are only a few tips that you can use to improve your performance at Guns of Glory. If you have any other pointers or beginner tricks that you’d like to share, feel free to do so in the comments section below.